Picher, C.; Anguera, J.; Puente, C.; Kahng, S.; Andújar-Linares, A. The study of the interaction between human head and handset antennas should be taken into account since all the mobile phones have to guarantee a biological compatibility. 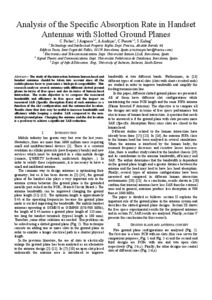 This research analyzes several antennas with different slotted ground planes in terms of free space and also in terms of human head interaction. The main objective is to compare the measured bandwidth and efficiency in free space and the impact on measured SAR (Specific Absorption Rate) of such antennas as a function of the slot configuration and the antenna/slot location. Results show that slots may be useful to increase bandwidth and efficiency while keeping a similar SAR compared to the non-slotted ground plane. Changing the antenna and the slot location is a good way to achieve a significant SAR reduction. Picher, C. [et al.]. Analysis of the specific absorption rate in handset antennas with slotted ground planes. A: European Conference on Antennas and Propagation. "Proceedings of the 4th European Conference on Antennas and Propagation: EuCAP 2010: 12-16 April, 2010: Barcelona, Spain". Barcelona: Institute of Electrical and Electronics Engineers (IEEE), 2010, p. 1-5.